It’s only Week 3 of the Kansas high school football season, but for a handful of teams the road to the state playoffs begins now. District play kicks off this week in three of the 8-Man districts that were slotted with seven teams instead of the standard six-team district. While each of these teams will have one more non-district game remaining on the schedule due to the odd number of teams, the playoffs essentially begin now. And there are some key match-ups this week. It would be difficult to compile an argument against this district being the classification’s toughest over the past four years. The east-side representative in the 8M-I state championship game has come from this district in each of the past three years. District member Osborne captured the 2013 8M-I state title, while Hanover (2014) and Mankato-Rock Hills (2012) have each finished as the state runner-up during that span. In fact, the 8M-I sub-state semifinal game has featured both teams from this district in each of the past two seasons. This year District 4 appears to be as competitive as ever. Traditional power Hanover reached the state championship game last season, but returned only a pair of defensive starters from that team. Still, Matt Heuer’s Wildcats are off to a 2-0 start with wins over Twin Valley League rivals Axtell and Frankfort. Hanover is ranked No. 4 this week and host Wakefield this week. 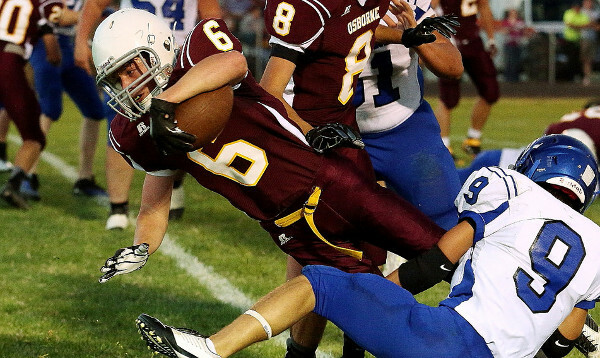 The Bombers began the season ranked third in the poll before a 42-6 loss at state-ranked Solomon last week. This game could very well decide the District 4 title in just the third week of the season. Other contenders in the district include an experienced Mankato-Rock Hills team, Osborne, Lincoln with standout quarterback Zac Walter, Clifton-Clyde, and Lakeside-Downs. This district has been one of the more competitive one in terms of number of teams with reasonable potential to acquire one of the two available playoff spots. Oberlin-Decatur Community won the district in its first year in 8-Man football last season, and was narrowly ousted by eventual semifinalist Ness City, 36-32, in the first round. The Red Devils return a strong nucleus again this fall, but were blown out in a 52-6 loss at 8M-II No. 2 Sharon Springs-Wallace County last week. Oberlin opens with the St. Francis Indians who are off to a strong start having posted a pair of shutouts over Triplains-Brewster and Tribune-Greeley County. The Indians haven’t reached the state playoffs since 2009, back when they were a consistent Class 2-1A contender. Atwood-Rawlins County is a traditional playoff contender and has six players with starting experience back from last year’s team that finished as district runner-up. The Buffaloes have reached the playoffs in each of the past two seasons after a rare two-year absence from the playoffs in 2012 and 2011. Other potential contenders in District 8 include Logan-Palco under the direction of new coach Mike Jenner. Jenner served as coach of Western Plains for a long time before coming over this season to take control of the Trojans. The Trojans opened with dominating wins over Golden Plains and Cheylin, but did so last year as well before struggling to a 2-4 finish in district play. Hill City and Quinter have each had a run of success a few years back, but have since fallen on hard times. Quinter won the 2009 state championship in the classification, while Hill City was state runner-up in 2010. The two schools have one combined playoff appearance since. The majority of these teams have been a part of the same district for several years now. They used to make up District 7 and now District 8 in this last cycle. The district has been primarily dominated by Sharon Springs-Wallace County, although Cheylin won the district title in 2010 and 2011 before falling on hard times. Weskan finished as the district runner-up to Wallace County in 2012 and 2013 before deciding to play 6-man football. Last season, Wallace County won its third consecutive district title, while Hoxie finished as the runner-up. The Wildcats and Indians have to be the odds-on favorite to claim the two playoffs spots our of District 8 again this season, although Triplains-Brewster is a program on the rise under Coach Tony Stramel. The Titans have finished 6-3 overall and 4-2 in district play in each of the past two seasons.